another familiar sight on Earth--lightning. One of the most interesting Huygens images released to date shows a network of dark rilles on Saturn’s moon Titan. Close inspection of such channels on Titan’s surface could provide a critical test of the Electric Universe. The history of science, like the history of religion, illustrates all too well how established ideas and vested interests can foster a contraction of vision. The result is ideology, and ideology obstructs our ability to interpret new and unexpected information. Under its influence we fall unwittingly into a stupor, no longer able to see clearly what is in front of us. The first symptom of ideology is that it requires increasingly tenuous or far-fetched “explanations” for unexpected data. In such circumstance a shock becomes necessary to break the stupor. 1. Escaping Methane. It has been known for years that methane is rapidly escaping from the atmosphere of Titan. Standard Theory before Huygens: Titan is billions of years old. Therefore, it must have vast oceans of methane to continually resupply the escaping methane. Electric Universe: No methane oceans will be found. Titan is losing its “primordial” atmosphere acquired from Saturn at its birth, perhaps only a few tens of thousands of years ago. Saturn has methane in its atmosphere. 2. No Methane Oceans. Neither Cassini nor Huygens have observed methane oceans. Standard Theory after Huygens. From Toby Owen, a scientist from Honolulu’s Institute for Astronomy: “There must be some source of methane inside Titan which is releasing the gas into the atmosphere. Otherwise it would have all disappeared.” This has led to the reinterpretation of the dark flat areas discovered on Titan by Cassini/Huygens: They were first interpreted as former ocean basins; now they are being interpreted as a layer of “organic goo.” Titan’s surface has been described as “an arid, icy desert, where periodic storms of methane rain create transient rivers that wash sooty soil from icy highlands out to short-lived pools and lakes. The pools dry up -- perhaps sinking into a sandy soil of glass-like water ice -- and the Titanian desert waits for another methane storm.” [The Planetary Society news, Jan 21]. Electric Universe. Venting of methane from beneath the surface is unlikely. None of the expected “volcanoes” or internal methane sources will be found. Titan’s atmosphere is not in equilibrium because it is a new moon that was born electrically from Saturn (which has methane in its atmosphere) only thousands of years ago. Titan has not had time to lose its natal methane. The flat basins are likely to be the depressions etched out by the most energetic and prolonged electric discharge events. They will have sinuous channels, like those seen in the “seas” on the Moon. Storms on Earth are an electrical phenomenon that requires the unique properties of the electrically polarized water molecule. Methane, being non-polar, would mist down to the surface and its erosion properties would not be comparable to rain storms. There was no evidence of a heavy mist at Titan’s surface. The Huygens surface penetration experiment (see point 13) can be interpreted as the probe hitting a surface rock before glancing off into the soil, or as punching through a layer glassified by surface lightning. 3. Sinuous Rilles. Winding river-like channels are seen on many dry planets and moons. Standard Theory before Huygens. The investigative team voiced no expectation of rilles on Titan. Electric Universe before Huygens. Predicted that rille networks would be a dominant feature on Titan’s dry surface. They are the blast channels of cosmic lightning where it snaked across the moon’s surface. 4. Rille Networks. Huygens observed a massive complex of dark rilles on Titan’s surface. Standard Theory. These rilles must be “drainage channels”. Rains of methane must periodically fall on the surface to feed the “rivers,” because no rain was observed. The channels must then carry the liquid methane into the observed basins, though those basins are now dry. Electric Universe. The rilles are lightning blast channels etched into Titan’s surface. They testify to the violent, geologically recent, electrical birth of the moon. They take the dendritic form of Lichtenberg figures, which look like some river systems on Earth. However, no rains of methane and no flowing “rivers” will ever be observed on Titan. The sinuosity and flow direction of the channels will defy the known physics of liquids draining under the influence of gravity. Catchment areas and feeder streams will be lacking. Tributaries will be stubby, often beginning in a circular crater, and have a tendency to join the main channels at right angles. [In ad hoc fashion, the Huygens science team interprets the stubby tributaries to represent ‘springs’ of methane seeping out of the ground, instead of the rain-fed channels]. Blast and corona discharge effects may cause some transverse patterns in the bottoms of the channels and to each side. 5. Absence of Large Craters. Large craters are present on most rocky bodies in the solar system. 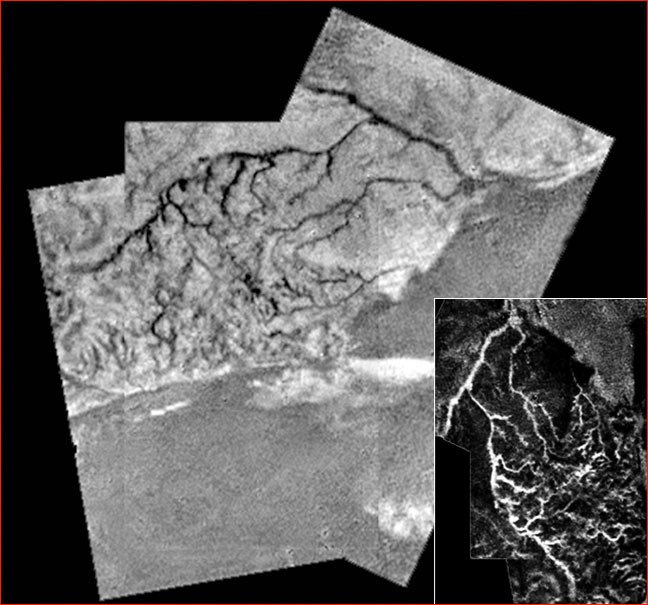 Neither Cassini radar images nor the images from Huygens descent revealed large craters on Titan. Standard Theory before Huygens. The investigative team expected to discover a number of large craters consistent with Titan’s assumed origin by accretion of planetesimals and an impact history over billions of years. Electric Universe before Huygens. Planets and moons do not form by impact accretion. Craters are electric discharge scars. Since Titan’s dense atmosphere would diffuse cosmic discharges into branching filaments (as Earth’s atmosphere does with terrestrial lightning), large craters should be rare if present at all. 6. Small Craters. It is not yet clear whether smaller craters appear in significant populations on Titan’s surface. Standard Theory before Huygens. Small craters are not expected because smaller objects would not survive entry through Titan’s dense atmosphere. Electric Universe before Huygens. Pitting or cratering is the means by which electric discharge etches a surface. Abundant populations of smaller craters will be present. But there will be a minimum size as well, due to the ability of the atmosphere to quench discharge channels at lower energy levels. Therefore, a limited range of crater sizes is expected to predominate, in bold defiance of standard impact theory. 7. Crater Chains. Many solid bodies in the solar system reveal non-random chains of craters. Standard Theory before Huygens. Crater chains are due to impact from fragments of a loosely aggregated comet that has been disrupted by gravity on approach. Titan’s heavy atmosphere would disrupt the supposed linear configuration before impact so crater chains are not expected. Electric Universe before Huygens. Crater chains are diagnostic of electrical discharge. They often coalesce to form channels with scalloped edges. They should be present in great abundance on Titan. 8. Rilles and Pits. Preliminary photographs of Titan’s surface suggest the presence of craters or pits along the rille networks. Standard Theory before Huygens. Investigators anticipated neither the channel networks nor the presence of craters along the channels. This issue is yet to be addressed. Flowing liquid does not generate craters along its path. Electric Universe. Craters along a discharge channel are commonplace. Often virtually continuous rivers of smaller craters will be seen winding along a discharge rille. 11. Surface Etching. “Etched” surfaces, marked by fields of pits, grooves and ridges, appear on various rocky surfaces in the solar system, though planetary scientists have not offered a coherent explanation. Standard Theory before Huygens. The investigative team did not discuss the possibility of surface etching on Titan. Electric Universe before Huygens. Electric discharge machining, or etching, is a well-known industrial process for accurate and smooth removal of surface material. At the microscopic level the surface is seen to be comprised of pits, grooves and ridges. Since plasma effects can be scaled over at least 14 orders of magnitude, the features seen under the microscope can be expected to be seen on a grand scale on planetary surfaces as a result of cosmic electrical discharges. No observed geologic activity produces a comparable effect. 12. Basin and Channel Floors. The dark regions on Titan seem to be relatively smooth-floored depressions. The sinuous channel floors are also dark and stand out from the bright hills. Standard theory. There is no clear explanation of what could have formed smooth-floored depressions on Titan. But the dark coloration is attributed to the accumulation of smog particles. Photochemical smog is thought to fall out of the atmosphere and coat the whole terrain. When it rains, the smog particles coating the surface get preferentially washed off the tops of the ridges, so there is a concentration of the dark organic smog materials in the bottoms of the channels. The dirty outwash from the channels empties onto the ice-sandy plains and sinks in to form the dark surface there. Electric Universe. At a planetary scale electric discharge etching is a primary means by which planetary surface material is extensively excavated. It operates by “spark erosion” of a periphery and may leave a smooth-floored depression with a steep, scalloped perimeter. The process is seen in action on Jupiter’s moon Io, where it leaves a smooth dark floor. No observed geologic activity produces a comparable effect. Surface darkening along channel floors is a feature of some cosmic lightning. An example can be seen on Jupiter’s second-closest moon Europa. In high-energy, electrically-induced “fritting”, two oxygen atoms combine to form a sulfur atom. Sulfur can take various highly colored forms ranging from black through red to yellow. That process or something similar can explain the preferential darkening of the channels on Titan. 13. Surface Material. Descriptions range from “sooty soil from bright icy highlands” to icy rocks and a “sandy soil of glass-like water ice.” Huygens penetrated the surface with a spring-loaded probe upon landing. The probe seemed to strike a hard surface, which then gave away to a softer soil. Standard theory. In the need to find a methane reservoir that is not apparent on the surface of Titan it is assumed that it must be hidden beneath the surface. So the softness of the soil is attributed to it being soggy with liquid methane. The brighter hilly features could be evidence of ‘cryovolcanism,’ the volcanic extrusion of water-ice material. The hills are fairly steep, with heights varying some 100 meters (330 feet) over a span of a kilometer (0.6 mile), and they exert topographic control over the pattern of the drainage visible in the Huygens images. Electric Universe. Planetary soils are deposited initially from space in the birth process and also in subsequent planetary electrical encounters where both exogenous dust and endogenous excavated surface material falls to the surface. The surface may be glassified by electrical discharges leaving a softer soil beneath. It is significant that the best match that the Surface Science team could come up with for the soil at the Huygens landing site was a simulant made of tiny glass particles, with a layer of solid glassy material on top. However, the Huygens probe may have struck a rock before being deflected into the soil. Some liquid methane may be expected in the soil but there is no requirement for a huge subsurface reservoir. The brighter material, like that on Io, may be the original surface material or material deposited after excavation from the channels, in the manner of Jupiter’s moon, Europa. The walls of the rilles are expected to be steep in the electrical model, with a predominantly V-shaped cross-section. And the channels are not constrained by topography, as is the case with flowing liquid: The rilles will course uphill as well as down. Standard Theory. Since Titan has been in place for billions of years, the planet and its atmosphere must be in equilibrium. Electric Universe. Because Titan is relatively young, its atmosphere is not in equilibrium. It is losing methane and other light fractions of its atmosphere, and this depletion may be measurable over a relatively short period of time. Standard Theory. Since Titan has been in place for billions of years, its surface temperature [atmospheric temperature at the surface] should be in equilibrium. Electric Universe Titan may show an anomalously higher temperature than expected, because it is probable that the moon is not yet in thermal equilibrium. Hence an anomalous temperature gradient could well be measured in the atmosphere or beneath the surface. The Huygens probe was not equipped to measure a subsurface temperature gradient. 15. Atmospheric nitrogen and Argon. Titan has a surprising enhancement of the heavy isotopes of nitrogen and argon in its atmosphere. Standard Theory. Over the 4.7 billion-year life of Titan it must have lost an atmosphere equivalent to that of a gas giant planet to give the observed nitrogen-15/nitrogen-14 enhancement. Argon-40 is conventionally though to be produced through the radioactive decay of the potassium-40 that was included in Titan's rocky core when it formed billions of years ago. Other isotopes of argon, along with other noble gases like krypton and xenon -- which should have been present in Titan's primordial atmosphere when the moon first formed -- are completely absent. Electric Universe. The noble gases anomaly shows that there is no systematic variation in the noble gas isotopes found in planetary atmospheres. It is another failure of the nebular hypothesis. The electrical birth of Titan and its interactions with other electrified planets and moons to achieve a stable orbit provide a complex atmospheric history. Heavy isotopes and radioactive species are formed during cosmic electrical exchanges through the “plasma gun” effect, which is a copious source of neutrons. The nebular hypothesis is over 200 years old. It demonstrates the powerful grip of an ideology in the face of advances in understanding the electrical nature of matter and space over that period.